The Chua Chu Kang Town Council has responded with regards to a Stomp article about a man found sleeping on the ground at Jurong, and has stated that they will assist him in getting back on his feet. This was in response to Stomper Jas’ concern, who believed that the man might be drunk. He was sleeping on the ground at Jurong West Street 91. We refer to the Stomp posting, ‘Is he drunk? Man found sleeping on ground at Jurong West’ dated 25 February 2014. The man seen sleeping at Jurong West Street 91 has been identified as a former cleaner for one of the Conservancy Contractors of Chua Chu Kang Town Council. It is of our understanding that this man no longer works with our Conservancy Contractor. Chua Chu Kang Town Council has also referred this case to the relevant agency that will help render the necessary assistance to him. 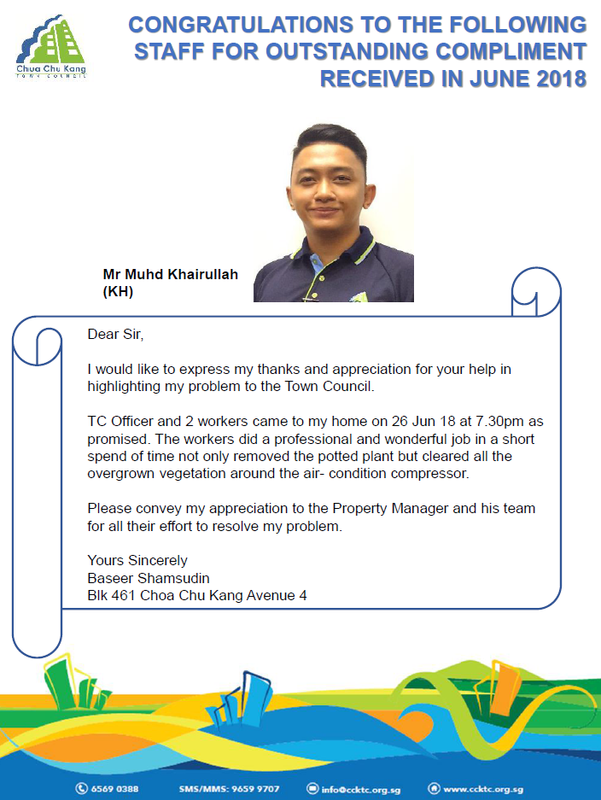 A resident was given a recognition award during the COPS ROLL OUT event yesterday for helping elderly escape fire at Choa Chu Kang Ave 2 Blk 297C. 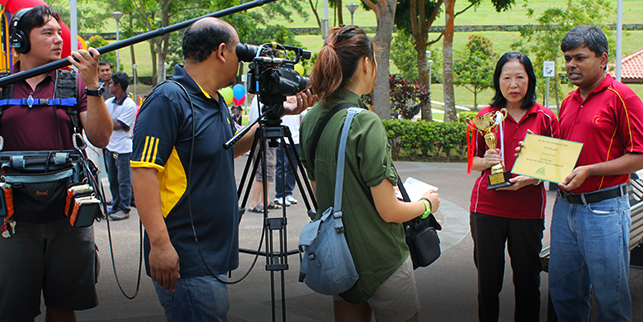 He also volunteered to join in Chua Chu Kang Citizens-On-Patrol system. Out of the 35 police stations, 20 have already implemented Citizens-On-Patrol system and by 2015, all police stations will have the system in place. Minister Gan Kim Yong officially launched the new Community Policing System (COPS) in Choa Chu Kang yesterday morning at the event. COPS is a nation-wide transformation of frontline policing strategies which aims to improve the way in which the current neighbourhood Police Centres (NPCs) works in, with and through the community. 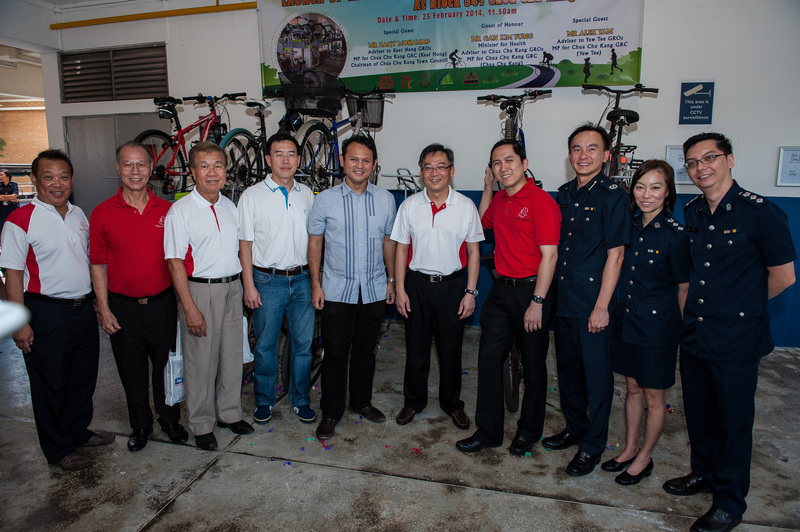 Minister Gan also launched the bicycle bay at Choa Chu Kang Loop Blk 341 which consists of 12 two tier bicycle racks and CCTV. The CCTV will enable the residents to park their bicycles at the bicycle bay with an ease of mind. Grassroots Adviser, Mr Zaqy Mohamad mentioned that many residents are afraid to park their bicycle at the bicycle bay due to theft and parked the bicycles at the corridors instead. This will cause inconvenience to other residents by obstructing the emergency escape route. Arising from the water tank incident at Block 686B Woodlands Drive 73, many residents have raised concerns on the security system of water tanks. The PAP Town Councils would like to assure our residents that there is a proper security system in place. The water tanks at the roof top are secured with locks. In addition, access to roof top is also secured with lockable door. The issuance of keys is restricted to authorised personnel for maintenance and emergency work. To further enhance our current security system, the PAP Town Councils will adopt additional security measure by allowing only authorised Town Council staff and our Emergency Unit (EMSU) to have access to the water tanks. The PAP Town Councils will continue to further enhance the security of the water tanks and roof access to better serve our residents. Most town councils did well in the Ministry of National Development’s (MND) latest report on town council performance, covering the period of April 2012 to March 2013. The report, called the FY2012 Town Council Management Report (TCMR), measured the performance of the 15 town councils in Singapore using five indicators: cleanliness, maintenance, lift performance, S&CC (service and conservancy charges) arrears management, and corporate governance. Ang Mo Kio, Bishan-Toa Payoh, Moulmein-Kallang, Sembawang-Nee Soon and Tanjong Pagar were graded green in all five performance indicators. The grading follows the colour system of the traffic light: green, amber and red. Nine town councils were rated green for four out of five indicators. Chua Chu Kang, East Coast, Holland-Bukit Panjang, Jurong, Marine Parade, Pasir Ris-Punggol, Tampines and West Coast were rated green for all indicators except for estate maintenance, for which they were rated amber. Potong Pasir was rated green for all indicators except S&CC arrears management, for which it was rated amber. Aljunied-Hougang-Punggol East was rated green for estate cleanliness and lift performance, amber for estate maintenance and red for S&CC arrears management. Its grading for governance was not available at the time of news release, said the ministry statement. In a statement that it issued Thursday on the report, MND said most town councils performed well in their core functions, including cleanliness, lift performance, S&CC arrears management and corporate governance. It singled out estate maintenance, particularly in keeping common areas clear, as an area for improvement for some town councils. It cautioned that obstructions in common areas are potential fire hazards and can hamper evacuation during emergencies. Routine Maintenance Services – Routine maintenance services will be carried out based on MOM’s guidelines with regard to outdoor work and prolonged exposure to the environment. Non Essential Maintenance Services – Non-essential Maintenance Services such as landscaping works, block washing, bulky items removal and spring cleaning of market/food centres, pruning and tree felling activities etc shall be postponed. Essential Maintenance Services – As for Essential Maintenance Services such as lift rescues and emergency repairs, we shall equip workers with the necessary safety gear for safety and health protection. All workers will be issued with N95 masks. Cleaning operations shall be carried out for essential areas such as lift lobbies. No block washing, no bulky items removal and no spring cleaning. Clearing of refuse chutes will be carried out using mechanized equipment, and workers will be issued N95 mask if required. Pruning of trees or felling activities are to be postponed. Avoid going to rooftop and water tanks areas unless for emergency purposes. The Town Councils would like to seek the understanding and co-operation of our residents in the above work arrangements. We will continue to provide essential maintenance services while safeguarding the safety and health of our workers. Public housing residents in the 12 town councils run by the PAP can now use their smartphones to report defects and maintenance issues, thanks to the launch of a new app. Dubbed iTown@SG, the app was launched on Monday with an investment of $100,000 over the past six months by PAP Town Councils. “The key thinking is to provide an additional communication tool for residents with smartphones,” said Dr Teo Ho Pin, coordinating chairman of the PAP Town Councils. For instance, residents can take a picture of a broken railing or dirty common corridor and submit the pictures via the app. A feature allows the exact location of the fault to be captured even without residents entering any address information. This is because Singapore Land Authority’s mapping data has been built in to the app to work with a smartphone’s Global Positioning System (GPS) function to pinpoint one’s exact location. The app has also been integrated with the PAP Town Councils’ existing estate management system – Integrated Estates Management System (IEMS) – so that fault reports are captured automatically. Service contractors will be alerted by IEMS for problem resolution. Based on standard, current protocols, lift breakdown, for instance, must be attended to in 25 mins, whereas unswept or dirty corridors, within a day. Once the fault is resolved, the IEMS will be updated. Residents will also know that the problem they reported is resolved through the app. The app can be used on both the Apple iOS and Android platforms. The Town Council received a complaint from a resident pertaining to his neighbour burning joss sticks at the common corridor near to his unit. In trying to help the resident resolve the concerns, our officer put up the said notice at the block. The notice was only confined to the block which the officer was overseeing. A concerned resident complained about the notice on 1st of April 2013. The Town Council recognized the inappropriate messaging. Thus, we took the notices down as soon as the complaint was received. Unfortunately, a photo of the notice had already been sent to the press. The Town Council recognises that the message was poorly conveyed and did not mean to offend anyone or any religious practice. The Town Council recognises that it could have done better in the handling of the complaint and the supervision of our officer in the messaging of the notice. The officer involved has been counseled accordingly. The Town Council would like to apologise unreservedly for any offence taken by our residents and any distress caused to the public. We will strive to better handle such situations and be vigilant in our outreach to residents. Residents may give their feedback at telephone 6569-0388 any time during office hours or email to info@ccktc.org.sg.